Of all fabrics, linen may age the most gracefully. Softening with every wash yet retaining strength, properly looked-after linen can last for generations. We believe loving your clothes for a long time is one of the best ways to be sustainable, so here’s some tips for extending the life of your favourite flaxen fabrics. The fibres are strongest when they’re damp, so even the most delicate shirts or slips will do well in a washing machine – but always make sure to check the manufacturer’s instructions before you wash. Keep the water warm or cold – the smooth surface of the flax fibres means stains are easily shed. A 30 degree cycle will also use less energy than other temperatures. Linen is highly absorbent, soaking up twice its weight in water before dripping. It’s a quality that makes it a superb summer fabric – but also means it should be washed in a machine with plenty of room to spare so it can move around. In terms of detergent, keep these gentle and avoid bleaching. It’ll weaken the sturdy flax fibres and take years off its life expectancy. If you need to whiten your items, this can be done with oxygen-based bleach. While washed linen may be tumble-dried at a moderate heat, most of the time you shouldn’t. Tumble-dryers tend to over-dry the fibres and set in those dreaded creases. Instead, hang your items to dry on a line or a clothes horse and dry knitted linens flat. As a quick-drying fabric, it won’t take too long. We love the relaxed crumples of well-worn linen. These creases get softer and comfier with age and can be enjoyed as the definition of laid-back cool. However, a crisp linen shirt or dress is sometimes desirable. In these cases, you should iron the material while it’s still damp – first on the wrong side to remove the creases, and then on the right side. The temperature of the iron should be chosen based on the fabric’s weight and composition. 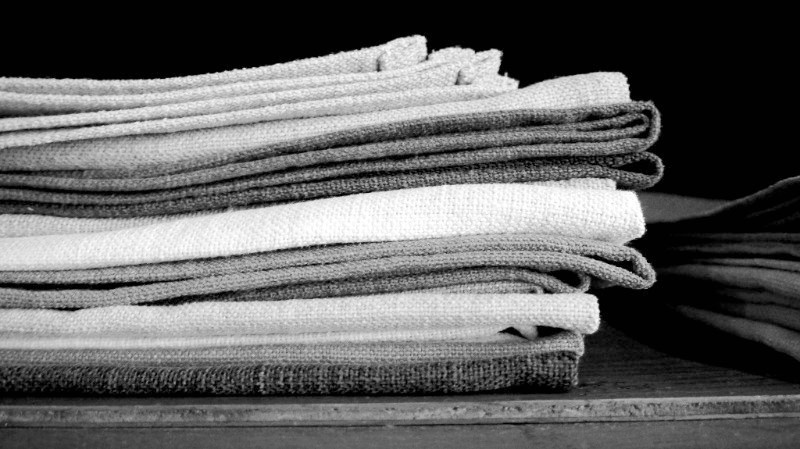 Pure linen can be ironed at a very high temperature, but blends may not. Experiment first on a corner of the fabric as a too-hot iron can make dark colours turn shiny. A good steam iron works best.